A longtime fixture on the Southern California jazz scene as a jazz guitarist and a music therapist, George J. Gilliam recently recorded his definitive album. Many Roads Home showcases his playing talents in an intimate pianoless trio, a perfect setting for his guitar solos. Born and raised in Gary, Indiana, George J. Gilliam first played clarinet before switching to the guitar when he was 13. “Early on I heard blues, my father (saxophonist Ira H. Gilliam) liked to listen to Dinah Washington, and I listened to a lot of jazz. When I was young, a friend would bring me to Chicago to the Plugged Nickel to see Wes Montgomery play whenever he was in town.” After working extensively in Chicago, George majored in music at Xavier University where he met and played with a high schooler named Wynton Marsalis. He toured with the James Rivers band, settled permanently in Southern California, married the talented singer Elena Gilliam, gigged regularly, and became a musical therapist, founding Creative Identity. Among his best previous recordings are his trio set Stepping Lightly, and Recorded Moments in Time which was made with his wife Elena. “For Many Roads Home, my goal was to record a well-rounded set of music that is drawn from a variety of sources,” says the guitarist. “There are many ways to approach these songs, from the blues and straight ahead to other possibilities; many roads to get home.” On this project, he was fortunate to be joined by two masterful musicians. Bassist Michael Saucier has played with a countless number of groups in Los Angeles for the past forty years including, in recent times, with John Bolivar, Billy Mitchell and in the musical play Billie Holiday: Front And Center. Don Littleton has long been a busy session and studio drummer and percussionist when he is not leading his own groups including the Jazz Conclave Latin Soul Band. Together they give George Gilliam stimulating support that inspires him to play at his most creative. Many Roads Home begins with Antonio Carlos Jobim’s classic bossa nova “Triste.” One of Jobim’s most likable melodies, this piece is taken by the trio at a perfect tempo. Gilliam’s pretty chords during the melody precede some melodic improvising, a chorus by Saucier, and excellent playing over the closing vamp. Michael Jackson’s “Human Nature” would be considered an offbeat choice for a jazz record if Miles Davis had not found beauty in the melody and featured it in the 1980s. “We took the pop tune and added some of ourselves to it” says Gilliam, who displays the ability to play both pretty and funky at the same time. Saucier’s bowed bass during the melody is a special touch. The guitarist’s “Highway 61” is a soulful medium-tempo blues that gives him an opportunity to wail a bit. George Gershwin’s “But Not For Me” is taken at a medium-slow ballad pace with Gilliam’s use of octaves recalling the early inspiration of Wes Montgomery. “I remember hearing ‘Jive Samba’ in the 1960s and always loving how playful it sounded.” Nat Adderley’s song (which was made famous by his brother Cannonball’s group) is not covered often, certainly not by a guitar trio. This relaxed version uses space well and has a hypnotic bass pattern. A change of pace is offered by “Bouree,” a Bach melody that has George Gilliam engaging in some classical-oriented playing, at least for the first two minutes before the performance becomes a soulful strut. A spirited and swinging version of Horace Silver’s “Juicy Lucy” is next. The melody, played over the chord changes of Charlie Parker’s “Confirmation” is quite singable. Suffice it to say that listening to the soulful and swinging music of Many Roads Home cannot be anything but a positive experience! O's Notes: Guitarist George Gilliam leads a trio with Donnell Lambert on bass and drummer Donald Dean. They are Steppin' Lightly on this session but not so much they we weren't inclined to bob our heads! Gilliam's approach is absent of pyrotechnics but loaded with swing. It is the kind of music that leaves a grin on your face. We think this set of ten covers is on point! Performance Rating: 4 out of 5! 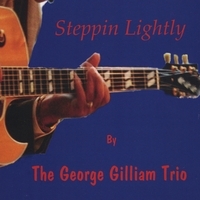 It's fitting that guitarist George Gilliam includes Wes Montgomery's "Jingles" on this program because his natural technique recalls the wonderful refrains that flowed from Montgomery's instrument. That both men hail from Indiana serves as mere coincidence. That both guitarists have shared a love and respect for the round tones that emanate from a guitar when handled with care - that's no coincidence. This comes from a common love for the music. Along with double basist Donnell Lambert and drummer Donald Dean, the guitarist offers a session of ten well-known jazz pieces performed with comfortable designs. Bass walks a pretty foundation while brushes grace the drum set eloquently and Gilliam purrs soothing melodies couple by warm harmony. They swing, but do so gently with poise and balance. Horace Silver's "Señor Blues," Cedar Walton's "Holy Land," David Raksin's "Laura" and three other memorable tunes by Joe Henderson allow the trio to carry the mainstream jazz torch. "Never Can Say Goodbye" closes the session with a big smile and a loving caress as Gilliam's guitar weaves its magic spell. On top of his degree in music from Louisiana, Gilliam earned a music therapy degree here in Southern California that fits his music like a glove. For the past 15 years he's worked with developmentally disabled adults, proving that good jazz can heal a troubled soul. The album title refers to guitarist George J. Gilliam's gentle touch. The playing on Gilliam's new album Steppin Lightly defines smooth; the icy coolness in which he handles his guitar delivers a spellbinding effect that doesn't fade even when the record has stopped playing. Clearly this was an album produced with not only a sense of purpose but veteran craftsmanship and spotless chemistry as well. Joined by bassist Donnell Lambert and drummer Donald Dean (the record is credited to the George Gilliam Trio), Gilliam surveys the territory between blues and jazz, effortlessly weaving the two genres together. On the opening track “Step Lightly," Gilliam's gradually enveloping blues riffs produce waves of atmosphere; they create layers of mood that are strengthened by Dean's snappy drums and Lambert's hypnotic bass. Gilliam's dreamy textures in “Falling in Love With Love" are awakened by Dean's startling pounding; together they capture the rising intensity of romance, from the warm whispers of infatuation to the banging heartbeat of true love. The crystalline prettiness of Gilliam's guitar gives Steppin Lightly an unmistakable air of romance. “Laura," for example, is awash with a profoundly yearning vibe. No words are needed to describe the feelings of deep affection that Gilliam is conveying here. “Beatrice," too, seems well suited for an evening stroll in the park with a spouse or lover. The tastefulness and classiness of Steppin Lightly lifts and invigorates the spirit; in addition, it cleanses the mind of any negativity, producing a sense of healing that is priceless. 4 of 5 stars for performance! O's Notes: Elena is a very good singer. George Gilliam is a fine guitarist who leads three different musical combos to support her. Together they give us an entertaining and enjoyable session filled with love. We enjoyed the bossa nova beats applied to "This Can't Be Love", "In A Sentimental Mood" and "What A Difference A Day Makes" sung in Spanish. They conclude with "I've Got The World On A String" and indeed they do!